In bronchitis the tissue lining the bronchi becomes irritated and inflamed, causing increased secretion of mucus and a narrowing of the airways. This produces the characteristic cough . For many people, the cough itself becomes an aggravating factor and worsens their condition. Up to 95 percent of cases of acute bronchitis are caused by viral infection, with most of the rest caused by environmental irritants. The most common viral causes are influenza, parainfluenza, and the common cold viruses. Unfortunately, in many cases (up to 70 percent), antibiotics are prescribed for acute viral bronchitis, making it one of the leading situations in which antibiotics are misused. Unfortunately, there is little that can be done to stop an episode of acute bronchitis once it begins. The most common recommendation for treatment is to wait for the inflammation to subside naturally, which will relieve the coughing and other symptoms. In very severe cases, a physician might recommend medications that limit coughing, reduce mucus production, and open airways. However, many of these medications have unpleasant side effects. Homeopathy prevents the excess mucus secretion and also relieves the cough symptoms gradually. The tendency of some person to get the acute infection very frequently. 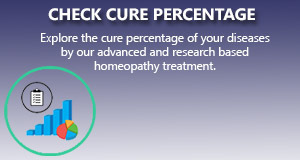 That tendency can be altered by homeopathy treatment as homeopathy works at immune level. Once this susceptibility get improve the person will not be affected by frequent bronchial infection further. In our Multicare homeopathy online treatment center peoples suffering from chronic bronchitis have been benefitted using our advanced homeopathic treatment packages. We apply the most scientific and research based homeopathy treatment package for bronchitis that gives a long standing improvement to the ailment.